Stories spanning the Elder Days of Middle-earth to the end of the War of the Ring, including how Gandalf sent the Dwarves to Bag End, and the ancient land of Númenor. Fantasy by J. R. R. Tolkien. 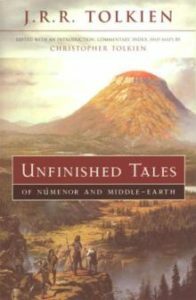 Unfinished Tales is a collection of narratives ranging in time from the Elder Days of Middle-earth to the end of the War of the Ring, and further relates events as told in The Silmarillion and The Lord of the Rings. The book concentrates on the lands of Middle-earth and comprises Gandalf’s lively account of how he came to send the Dwarves to the celebrated party at Bag-End, the story of the emergence of the sea-god Ulmo before the eyes of Tuor on the coast of Beleriand, and an exact description of the military organization of the Riders of Rohan and the journey of the Black Riders during the hunt for the Ring. Fantasy for teen readers and older. Supplemental to The Hobbit and The Lord of the Rings.